I’m sorry it’s been a while since I’ve posted anything. Sometimes life gets in the way of New Years Resolutions…and that’s fine. February is a busy month for me and Fiancee. Fiancee has a birthday just before Valentine’s day sooooo you could say we party hard in February. And by partying hard, we went to Dave and Busters to play games and eat dinner and went to work. I mention work last because no one really wants to go to work on your birthday. I’ve been pretty busy since we last spoke though…well, I post-wrote the last blog so I’m actually behind by 3 projects. Soooooo I will write about all 3 projects. YAY! I used my pretty pin pyrex for inspiration. It matches the terrible wallpaper in our kitchen. We peeled…skinned? Ummmm…we took the skin off of the chickpeas as per the instructions. It was pretty gross and chickpeas not in hummus smell pretty bad. I wasn’t very happy at the prospect of cooking so late, but fiancee in the corner really helped me get through it. Luckily, I was encouraged by the idea of testing out instagram stories. I would’ve put my boomerang I made here, but I’d have to upgrade my plan and I can’t afford that nonsense. I guess you’ll just have to follow me on instagram to see what crazy things I’m up to in real time. Getting past my shameless plug, here are my results after mixing a lot of stuff together to make a pretty delicious snack for the week. Now you might be thinking, “Geez Patti, what a crappy job.” Buuuuuut they still tasted great. Yes, there was a handful of burnt ones…but overall I still ate the burnt ones so they weren’t necessarily that bad? We’ve even made this recipe again since first trying it. It definitely was not as much of a fail as it could’ve been. If you’re interested in trying out the chickpeas recipe, please visit here! Side note of this day: We ended up going to Goodwill for something…and I took some pictures of some interesting things I found. Soooo without further ado, here is the first installment of Weird Goodwill Finds!!! What a wild ride this blog has been guys. Anyways, back to the original project: Creamy Swiss Chicken Bake. I will say I was very nervous about this one. Number first, I hate mayo and sour cream and usually Swiss cheese. That’s about 95% of this recipe. But I challenged myself to do whatever was on this pinterest board…so I had to. There isn’t anything complicated about this recipe. You literally dump things that are not really that good for you on something decent for you to make it terrible for you. A sentence to sum up America I suppose. Next you put the cheese one it. Then you mix together all the other stuff and make a jumbled mess of a concoction to spread over it. It smells like some weird dip that you wouldn’t want to eat. It looks absolutely disgusting. But then you sprinkle some Parmesan over the top to try to make it look semi-edible before popping it into the oven. The oven does some kind of spell to make it look delicious. I’m not sure how it becomes appetizing after that step, but it’s magic. It looks even better paired with almost expired instant mashed potatoes that we made for a side. Yes, you heard that correctly. We had some from when I got my wisdom teeth pulled and decided to use them before time got the best of them. It was delicious. Definitely not a fail on the part of the chicken…the mashed potatoes were questionable but no individuals got food poisoning from any part of this delish meal. Side note, not sure why I always burn everything. Maybe I’m not paying attention to time? I may also be paranoid of getting salmonella……………. If you’d like to try this recipe on your own click here! I bet you’re thinking to yourself: French toast sticks are already an easy dish to prepare Patti. Why do you have this recipe on there Patti? The answer being, I’ve never made French toast sticks in my life. 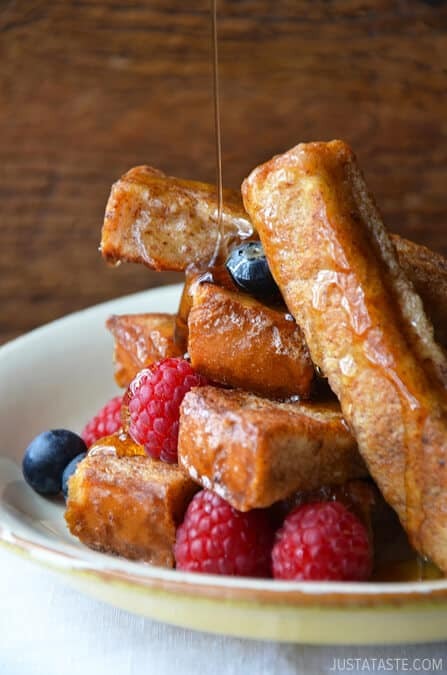 I have consumed French toast at various restaurants for brunch, breakfast, or even on occasion dinner. Let’s be frank: Breakfast can be any meal of the day of if you try hard enough. Let me take a moment to say that breakfast is my favorite meal besides pizza. And I love pizza so much that we’re serving it at the wedding…but breakfast was the next option. This recipe was a little bittersweet, because it was the last day roommate was going to be our roommate. He is now sound guy traveling. But on this day, he was still roommate and he deserved a farewell breakfast since he’d packed up all of his food and kitchen supplies. This was the first time cooking without his supplies, and let me tell you readers, I had not idea how ill prepared we were until those things were gone. I had gotten used to things like utensils and mixing bowls that could be placed in the dishwasher. We survived though. And as a result, we had a hearty breakfast of bacon, scrambled eggs with Alaskan King Crab, and french toast sticks. This recipe said it was easy…and it was. I ended up getting crazy and cut the recipe in half because it was not our main dish. Once I did that, I covered a lot of Texas toast that wasn’t as big as the Texas toast in the recipe…so I still ended up making a lot of French toast. I didn’t take any pictures during because our house was a wreck…but here’s the expectation and reality of the French toast sticks. Yeah…they’re a bit black. That seems to be the trend of this blog post. BUT roommate said that sugar cooks quicker than most things, so when we actually ate them they were fine. I just tried to hide them at the bottom since they were the first ones. I’d like to state that this was the biggest fail of the blog…just look at those pictures. They are two different things. But at the end I still had French toast, so I guess we’re all winners. If you’d like to try this recipe and make a fool of yourself like me, follow this link. That’s all I have today. It was a snow day so I was able to smash all of this out. I am supposed to make some type of banana and clean my makeup brushes…..but I forgot nutmeg for the bananas soooooo it may not be until this weekend for that and then who knows when I’ll actually post it. Guys. I have no idea what I’m doing. I’m planning a wedding, getting my Masters degree, trying to get healthy, working out, hanging out with friends, working full-time, being a good dog mom, being a good cat mom…and some I can’t even think of. Welcome to my brilliant idea of adding one more thing to my already full plate.